Endvest plans to uphold its mission by underwriting dozens of projects that create the most social and economic value for investors and communities alike. Last week, the crowdfunding portal launched a timber reforestation project in the Philippines. The company claims that this is the first in a series of projects that will showcase global responsibility while simultaneously delivering healthy profits to its investor base. The deal involves the extraction of government-planted timber specifically for harvesting with subsequent reforestation; for every tree that is harvested, three will take its place. Additionally, Endvest will partner with an agricultural company to help provide infrastructure and increase living standards for the natives who are otherwise impoverished. With all this, investors at Endvest will receive an 18% return every year while fueling an emerging economy. According to a recent crowdfunding research study, crowdfund investing, a mechanism for raising capital for businesses to start and grow, from small investors, will go live later in 2013. With the release of the proposed crowdfunding rules, a wave of small business and startup financing is expected to sweep the nation. In a first of its kind study, the Program for Innovation in Entrepreneurial and Social Finance, at the College of Engineering at the University of California, Berkeley released a primer on the size of market. The Fung Institute for Engineering Leadership, based out of the College of Engineering’s has a mission to establish the world’s leading academic and applied research; teaching and policy regarding innovations in how entrepreneurs and small to medium sized businesses are funded. The Program for Innovation in Entrepreneurial and Social Finance was launched in November 2012 to study the impact of new financing mechanisms such as crowdfunding. 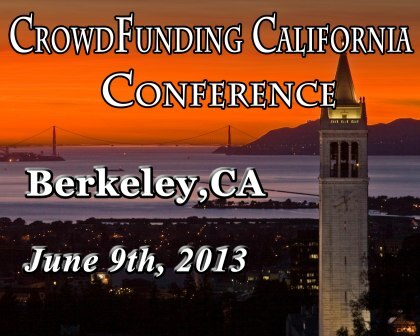 Crowdfund investing became federal law in April 2012 with the passage of the JOBS Act. The bill itself was one of the most bi-partisan pieces of legislation to come out of Congress last year. While new regulations for crowdfund investing are expected from the Securities and Exchange Commission (SEC) later in 2013, the new industry already has over 80 Internet crowdfund investing funding platforms being developed to apply for SEC approval. The excitement for crowdfunding is emerging in a number of countries. Governments are considering it as one tactic to address their nations’ most pressing socioeconomic challenges. The United Kingdom gave its seal approval with the Financial Services Authority (FSA) authorizing the first equity crowdfunding platform and Australia has had legalized crowdfunding for seven years, while the Italian parliament passed a decree legalizing crowdfunding in October 2012. The U.S. State Department, the World Bank, angel investor groups, incubators and investors in Latin America, European, Middle Eastern and African countries are exploring crowdfund investing and are seeking best practices and academic research on the topic. UC Berkeley’s College of Engineering is recognized globally for its research and educational excellence, consistently ranking among the top three engineering colleges in the United States. The college’s 4,600 students gain leadership skills through experiential learning, research internships and study abroad. A full-time faculty of more than 200 professors advance discovery and innovation in fields ranging from energy engineering and nanomaterials to synthetic biology. The college’s Fung Institute for Engineering Leadership offers a complete range of programs for engineers and scientists seeking professional and executive careers.